Among the newest favorite family movies, Toy Story is destined to become a classic. What happens when a child's favorite toy is replaced by a new favorite? Watch and find out. Toy Story introduces us to a boy named Andy, and his favorite toys. Sheriff Woody is Andy's favorite toy, the hero of all of Andy's adventures. Because he is Andy's favorite, Woody is also the recognized leader of all of the toys in the nursery. They are all preparing for moving day, because Andy and his mom have a new home. And then Andy's mom has an early birthday party for Andy, and Buzz Lightyear arrives in Andy's Room. Buzz, a spaceman action figure with light-up "lasers" and other modern effects, immediately takes first place in Andy's play. Woody isn't happy about being displaced. He tries to scare Buzz, and to intimidate him, but he fails. Even the evil Sid next door, a child who "tortures toys for fun," doesn't faze Buzz's immense self-confidence. It doesn't help that Buzz refuses to believe that he's "just a toy"; Buzz thinks he is the real Buzz Lightyear, and his constant "spaceman act" is thoroughly annoying to Woody. After a showdown with Buzz, Woody angrily plots a way to make Buzz fall down behind the desk, where Andy will not be able to find him. Unfortunately, Buzz falls out the window, and there is a witness who tells the others that Woody pushed Buzz. Buzz climbs out of the bushes into which he's fallen and onto the bumper of the family car, which is headed to Pizza Planet with Woody back in Andy's company since Buzz couldn't be found. When the car stops for gas, Buzz confronts Woody, and they fight, ending up under the car, and getting left behind. Woody is horrified -- he's now a Lost Toy -- a fate as good as death. However, the pizza delivery guy stops for directions, and Buzz and Woody are able to stow away in the guy's pickup, thereby making their way to Pizza Planet. Once inside Pizza Planet, Woody is focused on getting back to Andy, but Buzz is looking for a spaceship so that he can continue his mission of fighting the Emperor Zurg. 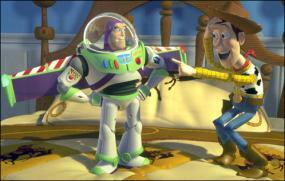 Woody almost gets the two of them into Andy's hands, but Buzz disappears at the last second, and Woody knows he cannot return to Andy's Room without Buzz. So he gives chase ... right into the large rocket ship that is a claw game. And it's the Evil Sid, not Andy, who takes them home. True to his reputation, Sid ties Buzz to a rocket and is going to blow him to the moon when it begins to rain. Woody has already been tortured and burned with a magnifying glass. It's here, at Sid's, that Buzz finally realizes the truth -- he's a toy, a child's plaything. He plunges into the depths of despair and depression. But Woody is still plotting a way to escape, and, with the help of the mutant toys inhabiting Sid's room, he hatches a plan that is against all of the rules of how toys are supposed to behave, but that he hopes will benefit all of them. 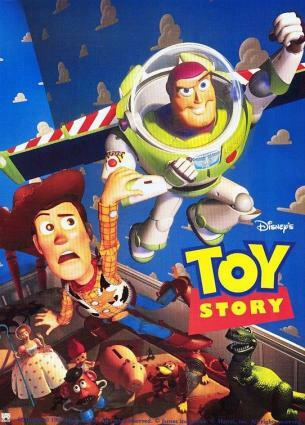 In the nick of time, Woody saves Buzz from being blown up with the rocket, and leaves a lasting impression on Sid that will cause him to be careful of -- if not terrified of -- his toys and those of others. But just as Woody and Buzz are free, Andy's car pulls out of the driveway for the last time. Buzz and Woody give chase, but they are no match for the car's speed. Buzz and Woody next try to get into the moving van, but Evil Sid's equally evil dog pulls Buzz off of the truck. Woody gets into the van and gets the remote control car, horrifying all of the other toys, who think that he's "murdering" RC just as he did Buzz. Just as Woody manages to get Buzz away from the dog, the other toys throw Woody off the truck. Woody is despondent. How will he ever get back to Andy now? But he suddenly realizes that he can use Buzz's face shield to light the fuse on the rocket that Buzz is still taped to. And thus begins the wildest ride ever. Woody and Buzz manage to get RC back into the truck before soaring high enough to drop through the sunroof of Andy's car, to Andy's great delight. One of the great things about Pixar productions is the hidden references to older Pixar pieces. For those in the know, these are "treasures" to find in every picture. One of the treasures in Toy Story is the lineup of books on the nursery shelf, the titles of which are some of the earliest Pixar pieces ever produced. There are also subtle references to more adult ideas -- things which will fly right over the heads of the youngsters, but which will keep the movie interesting and amusing to the grown-ups who will be forced to watch it 200 times in a row. John Lasseter received a special Oscar for the development of the techniques that made this first computer-animated film possible.